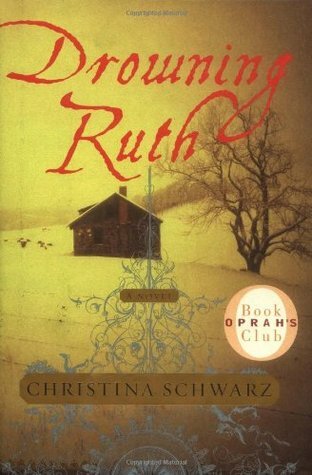 Drowning Ruth opens in 1919, on the heels of the influenza epidemic that followed the First World War. Although there were telephones and motor cars and dance halls in the small towns of Wisconsin in those years, the townspeople remained rigid and forbidding. As a young woman, Amanda Starkey, a Lutheran farmer's daughter, had been firmly discouraged from an inappropriate marriage with a neighboring Catholic boy. A few years later, as a nurse in Milwaukee, she is seduced by a dishonorable man. Her shame sends her into a nervous breakdown, and she returns to the family farm. Within a year, though, her beloved sister Mathilde drowns under mysterious circumstances. And when Mathilde's husband, Carl, returns from the war, he finds his small daughter, Ruth, in Amanda's tenacious grip, and she will tell him nothing about the night his wife drowned. Amanda's parents, too, are long gone. This was a random find at the library and I was in the mood for a mystery. I was worried since this is an Oprah book and she is a hit-or-miss. Well - the beginning was confusing as hell. There was so much POV and time period switching. It was so hard to follow and actually care about what was going on. The only thing that kept me on the hook was finding out what happened to Mathilde. I had my theories, but I had a main one and I was rooting for because a certain someone would end up in jail forever and I would be okay with it. I can't tell you why I hated this certain person, but there is something wrong with this person and everything happened because this person is a selfish liar. I can't name names, because....just because. You'd know exactly who I was talking about if/when you read this. Poor Ruth and Carl. They were the true victims and I felt horrible for them. I do wish that Carl had more of a closing...I honestly think the author didn't want to deal with him anymore and wrote him off. So sad. Okay - after the confusing beginning, it did get somewhat better. I will admit that for sure. But it went from horrible to just meh. I enjoyed the mystery and finding out all the secrets and lies. However, the writing was left to be desired. The characters, besides for Ruth and Carl, were barely tolerable. The jumping between times and POV was a little less confusing, but still all over the place and sometimes I got lost in the narrative. Out of five stars, I am going to stamp this with 2. The only good part of this was the mystery and two characters. I don't blame you. It fell way below expectations and what I wanted from it.